A flash flood in 2015 washed out the road to Scotty's Castle. It is closed until 2020, according to the National Park Service. You can get its current status at the Death Valley National Park website. It's going to take so long because the damage was extensive. In just two days in late 2015, Scotty's Castle received four inches of rain. That's four times as much as it usually gets in a year. The castle itself wasn't badly damaged, but the visitor center was. Not only does mud and debris have to be removed, but electrical, water, and sewer systems need fixing and so do the nearby road. It may cost as much as $20 million to get it all fixed, according to the Las Vegas Review-Journal. If you want to see this landmark in the meanwhile, you can take a Scotty's Castle Flood Recovery Tour through the Death Valley Natural History Association. Tours depart from the Grapevine ranger station and guests travel to the house in groups. If you're going to Death Valley, there's still plenty to see. Use this guide to plan your perfect trip. It's not really a castle, just a big house with a tower - and Scotty never owned it. 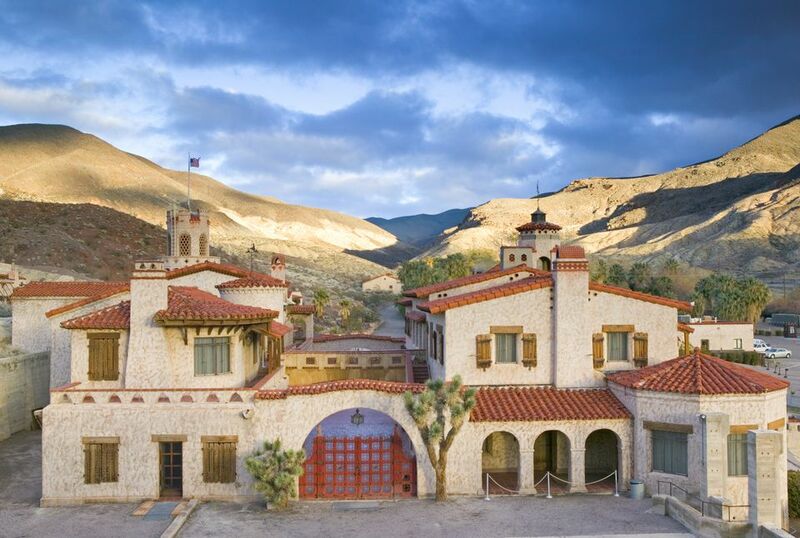 Its formal name is Death Valley Ranch, but everyone just calls it Scotty's Castle. This big house in the California desert has an interesting and colorful history, all related to the man for whom it's named, a California character called Death Valley Scotty. He was born Walter Scott, but by the time he got to Death Valley, he had been a rodeo cowboy and wild-west-show performer. He claimed to own a gold mine in Death Valley. Albert Johnson, president of Chicago's National Life Insurance Company invested in the mine but grew suspicious of Scotty's intentions. He went west to California for a visit, and instead of having a confrontation with the con man, he started a lifelong friendship with an unlikely person. Johnson's health improved in the California desert climate, and he built a vacation home here. Johnson visited occasionally, but Scotty was the one who took up residence in the house, claiming he built it with his gold mine proceeds and calling it Scotty's Castle. Read more of his story here. When it reopens, you will be able to visit Scotty's castle and take a tour. Until then, the road is also closed so you can't even get out to take a look around. I'd suggest you take that seriously. The Review-Journal reports that trespassing is punishable by up to a $5,000 fine or six months in jail, according to a sign posted inside the park. We like Scotty's Castle for its desert quirkiness. Besides the house, Death Valley Ranch also includes an electricity-generating powerhouse, solar water heater (built in 1929), a bell tower, stables, guest houses and cookhouse. Some can be seen only from outside. To get inside, join a ranger-led tour. They go inside the house, underground or even on a hike out to Scotty's real house (winter-spring only). If you have spare time while waiting for a tour, it's only a one-fourth-mile walk up to Scotty's Grave and you can also take a look at the exhibits inside the visitor center. Near the parking lot is the only shaded picnic area in all of Death Valley. You can buy dry snacks and water at Scotty's Castle, but that's all. They had a gas station years ago, but it's now closed. Scotty's Castle and Museum is located on Scotty's Castle Road at the north end of Death Valley, 53 miles from Furnace Creek. Take CA Hwy 190 north to Hwy 267 and turn right. Scotty's Castle will be on the left.